Just felt like this photo of a building in Shinjuku (Ward of Tokyo) was interesting. I believe the store is a work clothing shop. The character on the turtle reads "Win." Wasn't there a series of movies about a giant flying turtle that protected Japan? Turtles!! I love turtles. Us turtles have to stick together. Turtles are ancient and wise. That is a really cool building. I would have loved to be the one painting that mural but for the fact that I am afraid of heights. lol. 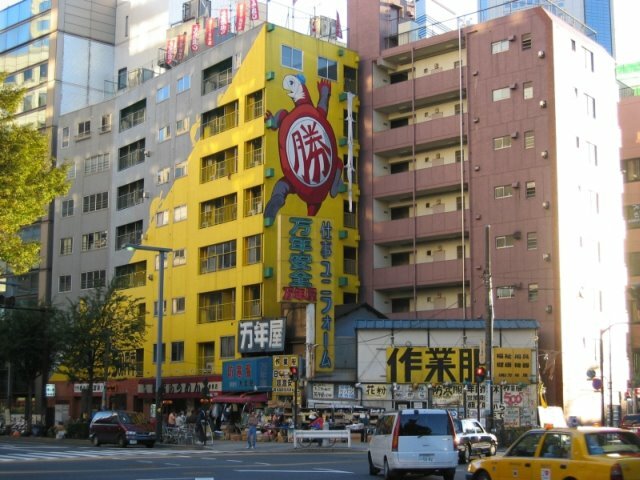 I just looked at the comments to see how one could comment on the picture of a building with a turtle on the side since there is no way I am that creative. But they did find ways. Wow!! !